The following anecdotal history of St. George Serbian Orthodox Church was compiled from church records and accounts of parishioners. The first Serb known to have settled in the Kansas City area was Stojan Stipanovic, who came from a Serbian village near Ogulin in 1898. Soon after his arrival, he sent for his wife, Ana. The local Serbian community grew and became a destination for Serbian families who wanted to emigrate to the United States from the villages near Plaski, Gospic, and Kordun in Austro-Hungary. In the early 20th century, Kansas City was a world leader in the meat packing industry. Most of the first Serbian immigrants to our area found work in the meat packing houses of the West Bottoms. In 1900, the small community of Serbians in Kansas City recorded its first death when Iso Vujnovich, from Divoselo near Gospic, Lika died from injuries in what records describe as "an industrial accident." The community showed its unity by taking full responsibility for his burial. Isaac's tragic and untimely death bore out the need for life insurance, which was costly and difficult to obtain, especially for non-English speaking immigrants. The Kansas City Serbs began meeting in various homes to look for ways they could better support one another. As a result of these meetings, Milivoje Tepsic from Perjasica, Kordun and Nikola Potkonjak from Divoselo near Gospic, Lika were appointed to investigate the possibility of forming a fraternal organization (which eventually became SNF Lodge #43). On April 4, 1904 a special meeting was held, their recommendations were accepted and the Serbian Orthodox Federation Srbobran was established. That original executive board consisted of Mane Dokmanovich - omerov from Plaski, Lika, ppresident; Jovo Janjatovic from Otocac, Lika, vice president; Marko Trbojevic - nogas from Jezero near Plaski, Lika, secretary; Rade Strika from Medjedjak near Plaski, Lika, treasurer; Nikola Potkonjak, financial secretary; Jovan Katic from Marindol, Slovenia, president of audit committee; Petar Bunjevac from Marindol, Slovenia, president of the sick committee; and Ilija Vujnovic from Divoselo near Gospic, Lika, marshal. This new organization was named after and dedicated to St. George who was the krsna slava, or patron saint, of the majority of the original families. The St. George Church building at 35 N. First Street. Church records provide this list of original parish family names (American derivatives of the original Serbian names are shown in parentheses): Ajdukovic (Aydukovich), Alincic (Allinich), Babic, Boca, Bosnjak, Bozic, Budimlija, Cankovic (Chandler), Damjanovic (Denonovich), Dokmanovic (Docman), Dodik (Dodig), Grba (Gerba or Gurba), Grkovic (Gerkovich), Hajdukovic (Dukovich), Jaksic (Yacich), Jancic, Jovetic (Yovetich or Harmon), Kalinic, Karleusa (Carrles), Katic, Kovacevic (Kovich), Krajnovic, Krneta, Latas, Licina, Ljubobratovic (Lubratovic or Jubratic), Markovic, Milic, Miscevic, Momcilovic (Monchil), Njegovan, Ogrizovic, Pavlica, Petrovic, Plecas (Pleacher), Pocuca (Ponich or Ponick), Potkonjak (Ponak), Risovic (Resovich), Skorupan, Stanar, Stjepanovic (Stepanovich), Stopa, Strika, Sumonja, Supica, Trbojevic (Terbovich), Uzelac, Veselinovic (Vesel),Vujnovic (Vunovich), Vukelic, Vukas, Zuzic. Later in 1904, a property on James Street in the West Bottoms (near what today is the UPS distribution center) was purchased to serve as the first Serbian community center. Shortly thereafter, the first Orthodox Christian services in Kansas City were held at the new hall whenÂ Fr. Paja Radosavljevich, M.D.Â began traveling from South Chicago to serve as part time priest. Over the next two years, he officiated several baptisms and weddings, blessed homes, and served the first Slava and the first Divine Liturgy for the community. The Kansas City Serbs moved forward with their desire to establish a church parish and purchased two nearby houses on North First Street. One would serve as the first parish home and the other would be remodeled with a bell tower and become their first church building. St. George Serbian Orthodox Church was chartered on April 18, 1906. The presiding bishop sent a highly ranked priest-monk, Archimandrite Joanikije Markovic, to bless the Serbian hall, parish home and church building. The first parish board president was Marko Trbojevic, originally from Jezero, Plaski. 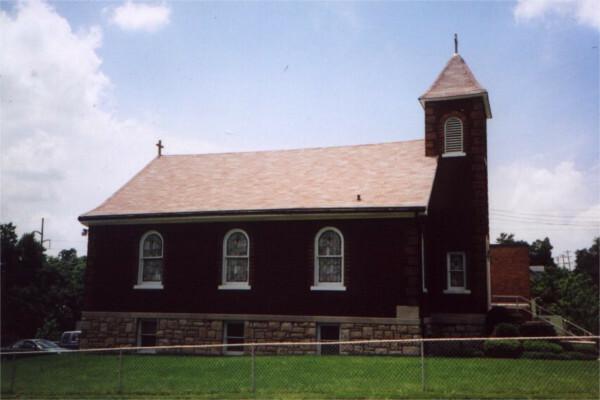 Being the first Orthodox parish established in Kansas City, the St. George Church served the spiritual needs of the Orthodox faithful of all cultural backgrounds in the area at the time. St. George Church at Lowell and Bethany in Kansas City, Kansas. When World War I broke out, several Serbs from the Kansas City community returned to Europe to fight for their motherland. About 25 young men made the trip across the Atlantic between 1915 and 1917, but the majority of them did not return. Several other parishioners served in the U.S. Army from 1914-1918. 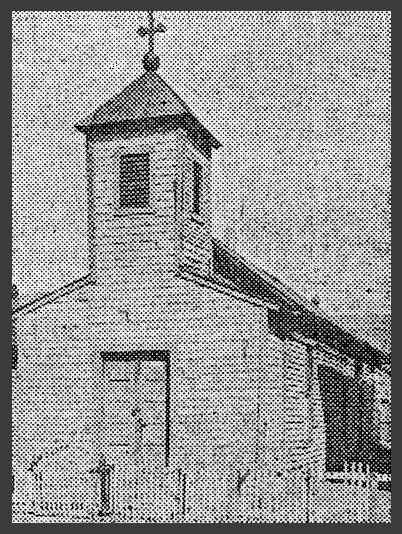 The community continued to grow, and built a new church building in 1925 at the corner of Bethany and Lowell in Kansas City, Kansas. The small parish building at this location would serve generations of parishioners for over 80 years. During World War II, over 50 Serbian-American men from the community served their country in the armed forces of the United States. Two gave their lives in the conflict: Mike Gerkovich and Joe Miscevich. Another parishioner, Dewey Stopa, gave his life the following decade in the Korean War. 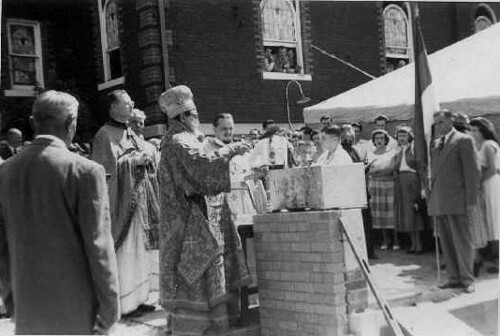 Bishop Dionisije Blessing the foundation of our memorial hall in 1953. From 1949 to 1953, almost 40 Serbian families came from "DP" Displaced Persons camps in Germany and other parts of the world to Kansas City. They were brought by Serbian Orthodox Diocese, Serbian National Defense Council of America, and through the efforts of concerned individuals. The social hall at the Kansas City, Kansas parish location was constructed in 1953 following the arrival of these new families. 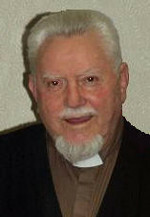 Proto Milan Bajich served as full-time parish priest from 1956-1996. Born in 1920 in Serbia's Srem region, Milan Bajich was the youngest of three sons. Both his parents passed away by the time he was 13, and he was raised by his grandparents from then on. Milan went on to graduate from Seminary Sremski Karlovci, a theology school known for its musical training. Milan left Yugoslavia during the Communist persecution of Christians that followed the outbreak of World War II, and spent several years in displaced persons camps in Italy and Germany. Protopriest Milan Bajich serving at St. George Church in Kansas City, Kansas. Sponsored by Protopriest Mladan Trbuhovich from the Serbian Orthodox parish in Cleveland, Ohio, Milan emigrated to the United States in 1949. He served as church cantor and choir director at the Cleveland parish, where he met Mary Coso, who would become his wife. After marrying in 1951, the couple lived in Cleveland for five years before Milan was ordained a priest and assigned by his bishop to serve as parish priest at St. George Church in Kansas City, Kansas. Father Milan worked with the choir, which at the time was all women, and instituted a capella singing. He translated and arranged church songs and Serbian cultural songs. St. George Church was among the first in the United States to have choral responses in the Divine Liturgy sung entirely in English. Father Milan and his wife raised eight children in the home across the street from the church, and as adults, the children of Father Milan and Protonica Mary remained active in the church throughout the years. Protonica Mary, who is still remembered for her kindness and hard work for the prosperity of the parish, passed away in 1986. Proto Milan passed in 2004. 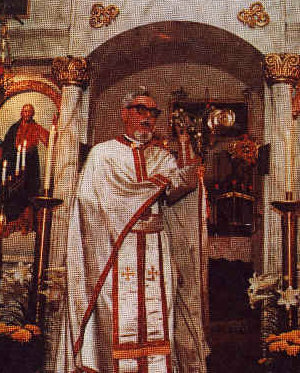 In 1995, a new parish priest joined St. George Church, Father Aleksandar Bugarin. Fr. Alkesandar served through St. George Church through July of 2018, and during his tenure St. George Church constructed and moved into its new building, in 2006, which is located in Lenexa, Kansas. Fr. Paja later moved to New York, and left the priesthood to begin a career as a scientist. Fr. Joanikije came from the Decani Monastery in Kosovo and served many Serbian parishes as an itinerant priest since he was a monk and did not have family. He is buried at the St. Tikhon Monastery cemetery in South Caanan, Pennsylvania. Fr. Jovan is buried in Johnstown, Pennsyvlania. Fr Jovan was born in 1887 in Strmen, Banija and passed on Nov. 30, 1942 in Akron, Ohio. He is buried in Mount Peace cemetery in Akron. Fr. Filip and his protinica, Vera, are buried at St. Sava Cemetery in Libertyville, Illinois. Fr. Hariton was born in 1885, and passed Nov. 30, 1926. He is buried in Economy Cemetery in Economy, Pennsylvania. Fr. Pavle is buried at St. Sava Cemetery in Libertyville, Illinois. Fr. Sofronije is thought to have possibly left the priesthood and returned to Yugoslavia, where he passed away. Fr. Pavle was born in Bukovac, Srem. He served many Serbian parishes throughout the United States. He is buried in St. Sava Monastery Cemetery in Libertyville, Illinois. Fr. Zivojin Ristanovich, March 1926 - 1927. + In June of 1941 he was murdered together with Bishop Sava and eight priests from the Plaski area by the Ustashe. Fr. Mane Momcilovich was born on March 16, 1876 in Mocila near Rakovica on Kordun in today's Croatia. He passed away in Akron, Ohio on Sept. 22, 1937, buried in Akron, Ohio. During this time, several part time priests served the parish. They came from Omaha, Neb. and St. Louis, Mo. A Russian Orthodox priest from Holy Trinity Church in Kansas City, Kan. served our community as well. Fr. Boro was born in Udbina, Lika. He passed away in early 1941 and is buried at Highland Park Cemetery in Kansas City, Kansas. Fr. Dusan was born in Lacarak near Sremska Mitrovica in Srem, Serbia in 1906. He passed awat and is buried next to his wife Milica in St Sava Serbian Cemetery in Los Angeles, California.